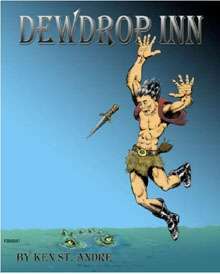 The DewDrop Inn is the most famous hotel on Trollworld. It's run by a retired adventurer, an old wizard who wants to try his hand at being Dungeon Master. You have nothing to fear in this hotel, unless you're an adventurer. In that case, you might be sorry you dropped in to the DewDrop Inn. By Ken St Andre, art by David Ullery. Intended for humanoid characters, level 1-5.